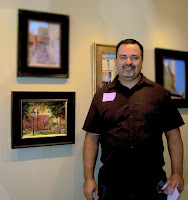 Jose's Art Journal: "Visions of the Rialto"
Well, I participated in my first official event with the California Art Club and I must say me and hubby Armando were VERY impressed. The SoPas gallery was marvelous, the people I met couldn't have been nicer, specially Miriam Noske who is an exhibits curator from the California Art Club and Tom R. Field the gallery manager. Among the wonderful artists let me mention Paul Strahm and his wife who gratiously lent me a poncho when we were oainting in the rain in San Luis Obispo, Debbie Holladay , Alex Schaeffer who has a great touch for contemporary landscape and Lynne Fearman. And I sold my painting to none other than the Chief of Police of South Pas. Now about those parking tickets...... just kidding.